The Seller: Bemes Home Medical is a locally owned and operated Durable Medical Equipment Provider that serves the Cardiopulmonary and Sleep Community by providing medical equipment, service, training, and education, along with comprehensive disease management programs. Bemes Home Medical performs its services in the homes of both pediatric and adult patients in Saint Louis and surrounding communities. The Close: The DVS Group represented the business owner, Mr. Rick Shore, in this transaction. We identified Mr. Bagwell as a strong strategic buyer, negotiated the transaction, and supervised all due diligence and closing activities. 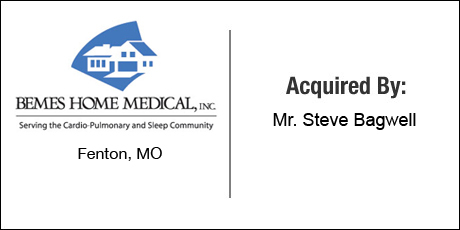 This transaction enhances the strategic position of Mr. Bagwell’s company and opens growth opportunity throughout the state of Missouri.